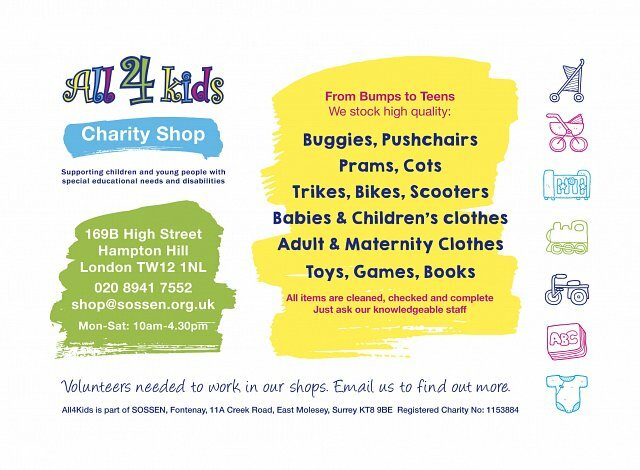 All4Kids and the SOS!SEN Charity Shop have a great range of quality adult and children’s clothes, shoes, toys, books, bric a brac, nursery furniture, equipment and maternity wear. Everything is checked, tested, cleaned and batteries replaced (when necessary). We are only happy to sell items that we ourselves would be happy to buy. 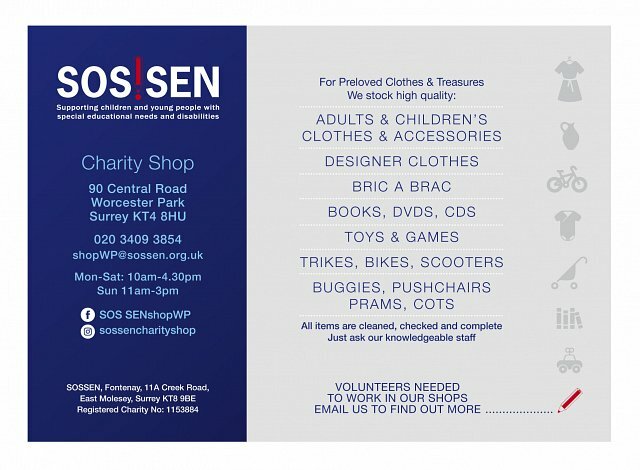 All funds raised through our shops help continue the valuable work of the charity SOS!Special Educational Needs. We love receiving your donations – they are what make our shops great. We are always in need of clothes, toys, books, equipment, furniture, pushchairs, maternity wear, and more. In fact, we never say no to anything! To make life a little easier we have rear access to our shop, in Hampton Hill. In Hampton Hill head towards the car park signed at Taylor Close and continue on the access road past the car park. The rear of our shop is on your right, we have a bright blue door and a bell to ensure you are heard! Old clothes, shoes, belts and bags that don’t quite make the grade are still valuable and can generate funds through recycling. So we will happily take any secondhand items that have given you good service. We can’t run the shops without our volunteers, so if you have a few hours to spare each week and would like to join a friendly, lively bunch of people, then please let us know. At present, we are in desperate need of people at the weekend – contact us on 020 8941 7552 for the shop in Hampton Hill or Debbie on 020 3409 3854 if you would like to help in our other shop in Worcester Park. 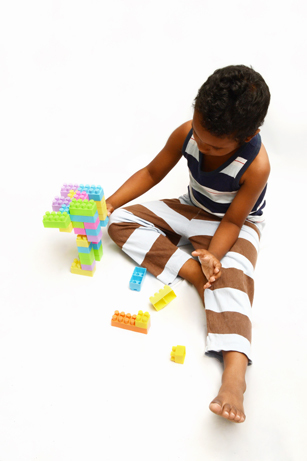 If you are searching for a particular item, such as nursery equipment or a specific toy, we will take your details, keep them on file for 8 weeks, and contact you if your request is donated. We feel that some donations will appeal to a broader range of shoppers so we have now set up our own eBay accounts. Why not take a look and see if there is anything to tempt you? Buses 267,285, R68 and R70 all stop outside All4Kids in Hampton Hill. Car parking in Taylor Close behind the shop in Hampton Hill. It's free at the weekends, so why not take advantage and do your shopping locally?